I get a lot of emails asking how I go about taking care of my hands and cuticles. The overly simplified answer is that I own 9 trillion different hand creams, balms, salves, and moisturizers. It’s so ridiculous that if you look in my purse right now you will find 3 hand creams (Neutrogena Norwegian Formula, Jaqua Butter Cream Frosting, Eucerin Healing Ointment), a nail salve (Embrace Bath & Body Nail Salve), and two cuticle balms (Sally Hansen Shea Butter Cuticle Balm, Qtica Cuticle Repair Balm). That’s *just* in my purse. Why does one person need a virtual army of moisturizers? Look, this addiction thing is no joke. In my compulsion, I’ve found that different products work better for different situations. For general cuticle care, I use cuticle balm several times daily. For after hand washing, I usually use the heavy duty ointment type stuff, Norwegian Formula or Healing Ointment. These have no scent and are very effective. However, every once in a while, I want something that moisturizes and smells delicious. The two wonderfully scented products in my purse are Jaqua and Embrace. I plan to eventually tell you guys about all the moisturizers I use (mmm fun), but today I’m going to give you the skinny on Embrace Bath & Body. I try to support small companies whenever I can. Embrace Bath & Body is comprised of two girls from Port St. Lucie, FL (right around the corner from where I live). They sell their products on Etsy (adorable) and just recently expanded into supplying vendors like Esther’s Nail Center. They make all natural highly affordable products: lip balms & tints, body powders, body & hand creams, foot balms, and hand & nail salves, etc. I can’t vouch for all their products, yet, but I love their Coconut Lime Verbena Nail Salve and Peppermint Fresh Feet Balm (more on this at a later date). The topic of today’s post is Coconut Lime Verbena Nail Salve. It contains mostly all natural ingredients: Olive Oil, Beeswax, Cocoa Butter, Jojoba Oil, Tea Tree Oil, fragrance (sadly, the frangrance is synthetic but oh well) and Vitamin E. To me the lime and coconut scent makes the nail salve smell kind of like mojitos, minus the alcohol. 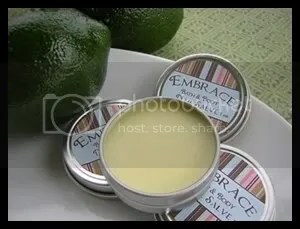 As someone who has used just about every moisturizer under the sun, I’m really impressed with Embrace Nail Salve. I love products that contain Olive Oil, Cocoa Butter, Jojoba Oil, Beeswax, or any combination of these ingredients, because these are all excellent and extremely effective natural work horse moisturizers. My mom, for example, has been using Olive Oil for as long as I can remember and her hands are the softest on earth. I use the nail salve the same way I would use a cuticle balm, rub into my cuticles and nails, but then I spread it all over. It does give my hands a somewhat greasy feeling initially, but the product gets absorbed quickly. Afterwards, all that is left is a light sheen and the delicious but subtle scent of coconuts and limes. The packaging, a small balm tin, is perfect. I love tins because they don’t let dirt get into the product, unlike pop-off or screw on caps. That’s important to me because, frankly, I live in filth, my purse is no exception. When I run out of Coconut and Lime Verbena, which will be soon at this rate, I plan to try out Embrace’s other nail salves Lavender Vanilla and Oatmeal & Honey. When I do I’ll let you guys know what I think.